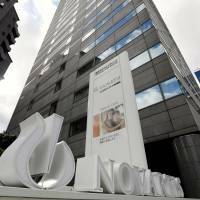 Last week, the Health, Labor and Welfare Ministry filed a criminal complaint with prosecutors against Novartis Pharma K.K., the Japanese subsidiary of Swiss pharmaceutical giant Novartis, alleging the firm made exaggerated advertising claims for its blockbuster blood pressure drug Diovan. The ministry alleges the firm played a part in tampering with data from clinical studies led by doctors at five medical universities to make the drug appear far more effective in preventing strokes and heart attacks than other hypertension drugs. 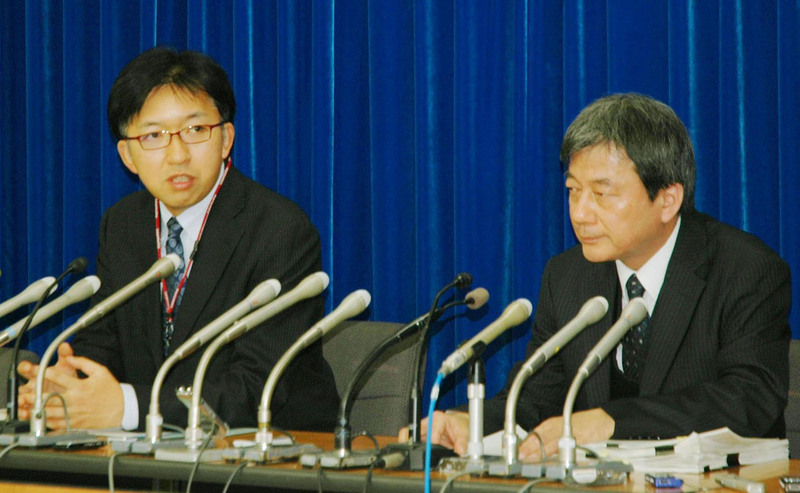 The ministry’s complaint, the first of its kind against a pharmaceutical company, has shed light on the dodgy standards of clinical studies in Japan, as well as the murky ties between scientists and the pharmaceutical firms that sponsor their research. 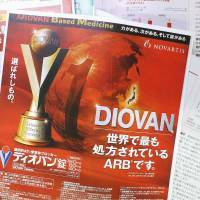 Following are questions about the Diovan scandal and medical research in Japan. What is Diovan and what does it do? Diovan is the product name for the angiotensin receptor blocker called valsartan. ARBs are a relatively new type of drug used to treat hypertension, a major health concern in Japan that the ministry says affects more than 9 million people. Hypertension can lead to hardening of the arteries, fatal strokes and heart attacks. The drug works to prevent the hormone angiotensin II, which causes the walls of blood vessels to contract, thus raising blood pressure, from connecting to receptors in the vessels. When did Japan approve Diovan and how popular is it? The health ministry approved the use of Diovan in September 2000 and it hit the market two months later. 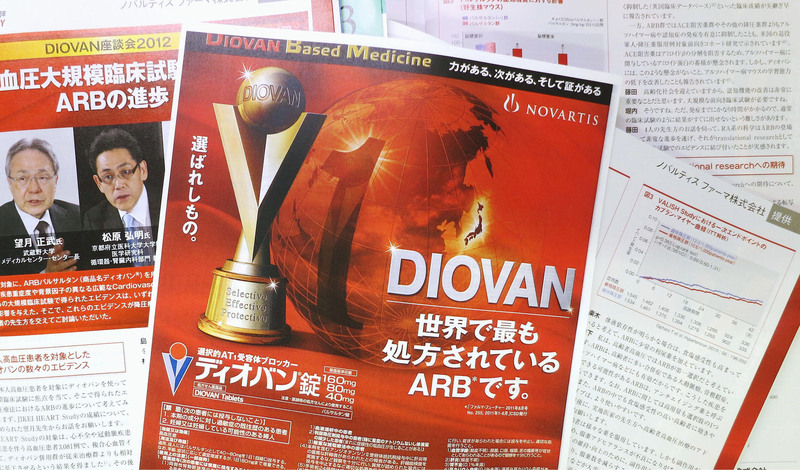 Novartis scored ¥100 billion in Diovan sales in 2012. What is the basis of the drug’s popularity? Starting in 2002, after it was approved to treat hypertension, five universities, including Kyoto Prefectural University of Medicine and Tokyo-based Jikei University School of Medicine, conducted large-scale clinical studies. Their research said the drug had “extra” benefits apart from simply reducing blood pressure, including lowering the incidence of strokes and angina. The findings were published in top medical journals in Europe, including The Lancet and the European Heart Journal, and were extensively used to promote the product. How did the alleged data manipulation come to light? Many outside experts questioned the research, which compared Diovan with non-ARB drugs, from early on. Iwao Kuwajima, chairman of the board of directors at the Tokyo-based nonprofit Japanese Organization of Clinical Research Evaluation and Review, said he found the papers suspicious immediately after the “Jikei Heart Study” came out in 2007 with the claim that Diovan alone was able to prevent strokes and heart attacks in 40 percent of patients at risk for such conditions. The “Kyoto Heart Study,” released in 2009, showed the drug succeeded in protecting 45 percent of patients from strokes or angina. Those rates were abnormal and inconsistent with the results of previous studies on the drug, Kuwajima said. “I would put my mother on an ACE inhibitor (a different type of hypertension drug), but valsartan is just good enough for my mother-in-law,” he added. Then in April 2012, Dr. Yui Yoshiki of Kyoto University Hospital wrote to The Lancet, pointing out that the average blood pressure numbers of the thousands of participants in the study who were given valsartan and the numbers of those who were given non-ARBs were exactly the same after the trial — a shady coincidence. The Lancet and the European Heart Journal subsequently retracted the Diovan papers, and Hiroaki Matsubara, who led the study at Kyoto Prefectural University of Medicine, resigned from the university last February. Many facts remain unknown, including who exactly manipulated the data. 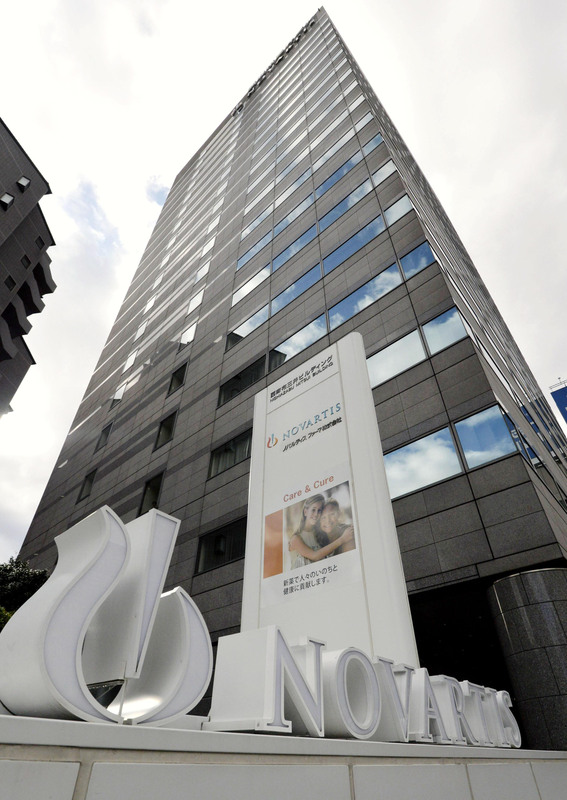 Last March, media reports revealed that a Novartis sales employee was involved in all five studies and that he had instead identified himself as a part-time lecturer at a public university in Osaka, hiding his position at the firm. The employee played a key part in handling patient data in all of the studies and allegedly manipulated them to benefit his employer. He left the drugmaker last May. 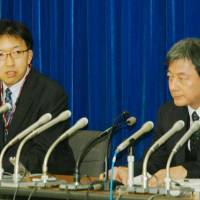 Although the ministry and Novartis have not identified the man, Democratic Party of Japan lawmaker Akira Nagatsuma, who raised the issue in the Diet in October, identified him as Nobuo Shirahashi. Despite the drugmaker’s denials of “deliberate manipulation or falsification of data” and of promoting the drug “with the knowledge of wrongdoing,” a panel convened by the health ministry concluded in a report issued Sept. 30 that Novartis was involved because it had the motive to push for “new evidence” to prevail in the high-stakes hypertension drug market. Novartis had also contributed large “research grants” to the five universities, including ¥190 million to Jikei and ¥380 million to Kyoto Prefectural University of Medicine, the panel revealed. Such grants are pervasive among university medical schools and are provided by many pharmaceutical companies. Observers said such funds are also dedicated to things beyond clinical studies, making it difficult to monitor how the money is spent. “The standard practice in Japan has been, ‘OK, this is the kind of money you can use, for whatever purpose,’ ” Kuwajima said. What’s wrong with university researchers receiving money from drugmakers? Researchers dedicated to making advances in medicine must be open about where their money comes from, because contributions from drug firms could lead to collusion and other conflicts of interest. In March, the Japan Pharmaceutical Manufacturers Association revised its disclosure guidelines, based on which member firms, beginning in fiscal 2013, started to reveal how much they provide annually to doctors and hospitals. According to figures compiled by the industry journal Yakugyo Jiho and published in its Sept. 25 issue, 36 drugmakers, including domestic players Takeda Pharmaceutical Co. and Daiichi Sankyo Co., contributed a combined ¥400 billion to doctors and medical institutions in fiscal 2012, of which roughly half went into research and development. The rest was paid as honoraria for speeches and magazine articles, as well as costs for “providing information,” in which “opinion leaders” in various fields offer their expertise in promotional leaflets and patient education materials. How can data-tampering be prevented? The ministry needs to have the power to penalize parties that falsify data after a drug is approved. The panel, including Kuwajima, that compiled the September report interviewed the Kyoto and Jikei research teams, as well as the former Novartis Pharma employee involved in the studies and its marketing manager at that time. But because the probe was not legally binding, the interviewees did not have to be forthcoming on the data-tampering, and both the doctors and drugmakers denied involvement in any wrongdoing, Kuwajima said, recommending that the ministry be given the authority to investigate and penalize wrongdoing. The Pharmaceutical Affairs Law has no regulatory power over clinical trials conducted for drugs that have already been approved. The panel’s report said the ethics committees of the universities failed to function as watchdogs from the standpoint of patients’ rights, and thus should include outside experts to ensure no cases of collusion occur.